Say for example you have a CMS :) You want to give full control to the developer to manage how their front-end members with authenticate, which could of course include ASP.Net Identity OAuth login providers. At the same time you want to easily allow your CMS to be configured so that ASP.Net Identity OAuth providers can be used for logging into the back office. In this scenario, the same OAuth provider might be used for both front-end and back-office authentication but authenticated under 2 different OAuth accounts. 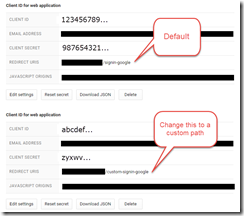 Another example might be if you have multi-tenancy set up for your front-end site and perhaps you want to use the same OAuth login provider but have members authenticate with different OAuth accounts for different domain names. One very important aspect of the default settings is the AuthenticationType. This is a unique identifier for the provider instance and this is one of the reasons why if you have 2 x UseGoogleAuthentication declarations with the defaults only one will ever be used. If you test this now, you’ll find out that only the first declaration is actually working even when you explicitly tell IOwinContext.Authentication.Challenge to use the “GoogleBackOffice” provider. 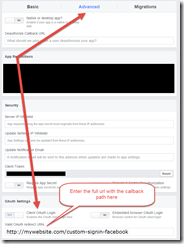 Since the CallbackPath will be the same by default on both above declarations, the first one that is registered will match and the other registered authenticators will be ignored. To fix this we’ll need to update the path that Google sends back and then update the second declaration to match that path. Hooray, now it should work!